The Colusa County Off Highway Vehicle program is assisted by an OHV trust fund that creates a team of Sheriff’s Deputies to patrol the rural and wilderness areas. The OHV team is made up of Colusa County deputies who are trained in ATV riding and safety. The team’s primary goal is to promote and ensure the safety of the off highway vehicles being operated in Colusa County. The OHV team also assists in search and rescue, medical aids, enforcement and education. The Colusa County OHV team operates in the fall and winter season, which includes the organized Enduro race season. The OHV team patrols approximately 160,000 acres with 110 miles of OHV trails along with allied agencies. The team is primarily dedicated to assisting the US Forest Service patrol the Mendocino Forest Grindstone district within Colusa County. The OHV team is also used in other areas of the county such as BLM land and the Bureau of Reclamation. 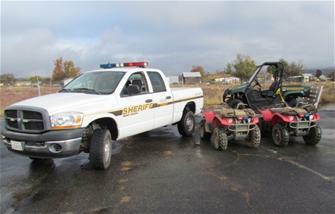 For more information about the OHV Unit, please contact the Sheriff's Department at (530) 458-0200. To find more information about motor vehicle opportunities in the Stonyford area, visit the United States Department of Agriculture Forest Service website.